Gearbox CCO: Homeworld "Meant Something to Me"
Speaking at PAX Australia Gearbox's Brian Martel discussed his love for Homeworld and drive to acquire its rights. Borderlands developer Gearbox turned some heads among the real-time strategy crowd when it purchased the Homeworld IP during the auction that effectively ended THQ. Those heads about spun in a circle when Gearbox announced it would be giving Homeworld and its sequel Homeworld 2 a new lease on life with HD re-releases. Speaking about the franchise at PAX Australia, Gearbox's chief creative office Brian Martel discussed his personal connection to the series and how it helped drive Gearbox to revive the property. 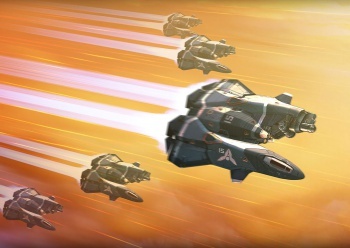 "[Homeworld] is one of those games that for me sort of moved me as brand. I was impressed with the story and it had some of the best spaceships that I have ever seen, outside of Star Wars," said Martel. In turn, the franchise's dormancy following the 2003 release of Homeworld 2 was something that bothered him. "I really thought that we should get it out there for the rest of the world. And a lot of folks haven't had a chance to play it, it has only been on DVD or CD, it has not ever been released digitally." When it became apparent that THQ was going under and its assets would be up for grabs Martel pushed for Gearbox to acquire it. "When THQ started to evaporate, Brian [Martel] kept coming to my office everyday and saying, 'Hey Randy, you got to get Homeworld,'" commented Gearbox CEO Randy Pitchford. "So we became part of that process bidding on the brand." Gearbox would beat out publishers including Aspyr Media and Paradox Interactive in the bidding for Homeworld and now, with the studio's plans to polish the games for modern audiences, stands to rekindle the dreams of countless fans who have been pining after the franchise since Homeworld 2. We can only hope the HD releases find success and perhaps make further Homeworlds a viable possibility rather than the unlikely dream they've seemed for close to a decade.